Wow. Just wow. What an amazing night of baseball. I barely, and I mean barely, was able to see a good portion of it. Here on the west coast the sporting night begins early — at 4PM — and since I had a rehearsal at precisely that time, I turned to my old friend the DVR. I set it to record both the Redsox/Orioles game, and the Braves/Phillies game. I knew I couldn’t watch them both, but my thinking was that if the Sox game was a blowout I would switch to the Braves game, insuring the greatest possible bang for my figurative buck. The thing about taping baseball is that the games almost always exceed their allotted scheduling. This means that you must tape the next few scheduled events or risk missing the end of the game. I had to do this for both games and since they were both on ESPN (one was on the deuce) I realized that there were potential late game pitfalls. Both stations run similar post game programming so it was going to be tricky discerning which station had which game once the initial three-hour block expired. Between the rehearsal, making dinner, and walking the dog I didn’t get to the baseball until 8:30 Pacific time. I decided to watch the Redsox game since I was in the mood for tragedy. For a while it looked like I had made the right choice. It was a close, tense affair, and by the 7th inning Boston was clinging to a 3-2 lead. Then…a rain delay. This was the first inkling that this was not going to be an entirely smooth evening. How was I going to find the proper event stored for completing the game? Would I have enough recorded events to see the ending? No matter — I switched to the Braves game. I knew that it was 3-2 Braves late. It was a simple matter of forwarding the event to the 2.20 mark, which was where I had left off in the Boston game. I picked it up in the top of the 8th inning in time to see the Braves reliever, Jonny Venters. work out of a jam. They failed to score in their half of the inning and in the 9th they brought on their closer, Craig Kimbrel, who promptly blew the save. And at that moment the recording lapsed. I went to my stored recordings and tried the first one I saw only to find weight lifting. I tried another and saw it was the Braves, but…it was the 12th inning. Somehow I had skipped over the intervening innings. Of course I was miffed, but at least I might get to see the ending. Jayson Heyward led off the inning with a double and was sacrificed to third, but the Braves could not get him home. The tape ran out again so I went to the next event. It was the Redsox and Orioles in the bottom of the 9th with two outs! (somehow I skipped the Braves and managed to miss the ending of that one) The Orioles were down to their last strike when Nolan Reimold smashed a ground rule double off of Jonathan Papelbon tying the game. Robert Andino followed suit with a single that Carl Crawford could only trap. Game over! But this was not all. The Tampa Rays had dug themselves out of a 7-0 hole to tie the Yankees. They were playing in the 12th inning, and after the Sox game ESPN promptly switched over. 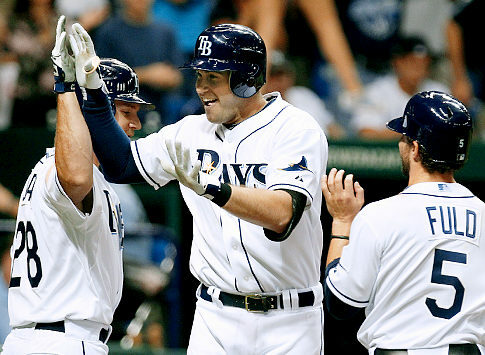 Evan Longoria was at the plate and he hit a line drive home run that barely cleared the left field wall. The Rays had come back from the dead to take the wildcard! Part of me had been hoping for some Thursday baseball, but I was happy with the two teams that won, and glad that I managed to see a large portion of the action. The best part is that these pair of choking teams — the Braves and Redsox — have eclipsed the Mets debacle of 2007. Happy days are here again! And now onto hockey. What’s this you say? Playoffs? No, I’m afraid that for me the enjoyable portion of the season has come to its conclusion. Nothing remains but another Yankee post season. I have a sinking feeling that they’re about to embark on a run that will end in Joe Girardi changing his uniform number yet again. Now where did I put that Sharks schedule? Somebody tell Mr. Selig to put his newfangled expanded playoff plan on hold. The old-fashioned wild car system is alive and well with a pair of improbable finishes. Going into the final day of the season the both NL and AL wild card races are in a tie. The Boston Redsox and Atlanta Braves may be running on fumes, but the pennant races are alive and well. Pennant race…it’s hard to believe I’m writing that phrase when a mere two weeks ago I was bemoaning the lack of drama in the 2011 season. How quickly things turned. How did this happen? On September 3rd the Redsox were a half game out of first and on a pace to win 98 games. They were nine games ahead of the Tampa Rays. They proceeded to go 7-19 in September and will have to rely on Jon Lester on three days rest. Let’s compare this fold up with another recent debacle — one that is quite painful for me to recall. The 2007 Mets were coming off a year in which they came within two innings of going to the World Series. They had a strong April and May, slumped in June, but recovered their winning form in July and August. Despite being swept by the Phillies in a four game series at Shea August 27-30, they proceeded to go on a tear, winning their next 9 of 10. On September 12th they found themselves 21 games above .500 and seven games ahead of division rival Philadelphia . They would only win five more games the rest of the season. They lost five of six to the lowly Nationals during the final two weeks, and despite falling behind the Phillies, they could have pulled even with a final game victory over the Florida Marlins. Tom Glavin started that game, allowed seven runs in the first inning, and the season was lost. I suppose this Redsox collapse would be worse, but just barely. Both the 2007 Mets and the 2011 Bosox had exceptionally high hopes coming into the season, and both teams had high payrolls. (albeit the Redsox payroll is insane) The Redsox have been hit hard by injuries whereas that Mets team, for the most part, was healthy. Even Pedro Martinez managed to return from his semi-permanent home on the DL to pitch a few meaningful games. As for the 2011 Braves, who have managed to squander an eight and a half game lead in the wildcard race, I hope they lose. Not only were they a longtime nemesis of the Mets, their star longtime ace and erstwhile Met, Tom Glavin, spit the bit in the clutch. Regardless of that, Atlanta fans do not deserve a winning team. Their tomahawk chop is offensive, corny, and tired, and they can’t even sell out playoff games. Either way I’m happy we are finally getting to see some drama. I’ll be hoping for both teams to win, or both to lose so that we’ll be treated to a pair of one game playoffs. Let’s play two! Thank you, Boston, for falling apart. Your late season ineptitude is providing us with the late season intrigue we so craved. At this writing the Redsox are clinging to a two game lead in the wild card race with the Tampa Rays hot on their trail. Good job out of Tampa going into Fenway this past weekend and taking three out of four from the Sox. 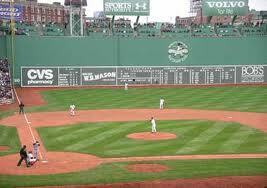 The only Redsox win came on a gutty pitching performance by Josh Beckett, who was returning from an injury. Beckett, by the way, is unwatchable. He holds the ball at least twenty seconds between pitches. The only way to watch a Redsox game is to have it on tape so you can at least fast forward through the commercials. I’ll be rooting hard for the Rays to pull this thing out. I’m sick of Boston’s act — I have no confidence that they will win a playoff round, let alone beat the Yankees in the ALCS. (let me take this opportunity to thank my readers in advance for not going into the Keitho archives and checking my 2011 playoff predictions) Plus, Tampa is such a feel good story — they have built up a good organization through the draft and a few canny trades. They play in a disaster of a stadium that looks like a prison field, compared to the designer parks of today. How can you not like them? And what’s this I see? Atlanta’s N.L wildcard lead has been whittled down to two and a half games. Just when I exhibited an unhealthy amount of man-love for the Braves, they have gone into free fall. They’re in playoff form — choking in crunch time. The Cards are improbably two and a half back, with the Giants right behind them at three and a half. The Braves will face the Marlins and Nationals, before closing the season out against the Phillies, (who will have nothing to play for) while the Cardinals play the Mets, Cubs, and Astros. Between the expanded roster, and delicate-genius LaRussa’s propensity for over-managing, look for the Cardinals box scores to take up entire pages of the sports section. It looks like we’ll be in for an entertaining last week and a half of the season. I know I’ll enjoy it. Come the first week of October my season of misery begins — suffering through another Yankee post season. Today’s post will be devoted to my esteemed guest-blogger, and best friend, Jeff Mazzei. Since he wrote this, (last week) a couple of the races have tightened up, but with only 15 games or so remaining on the schedule, time is getting short. The Redsox, with their myriad of pitching injuries, have somehow let Tampa back into the picture; they are four up in the wild card race. In the NL wild card, while I wasn’t looking the Cards crept to within four and half of Atlanta. But enough of me. Here’s Jeff! I don’t know why I should be surprised and confounded by this, but with the pennant races evaporating, all I read is how we need another wild card team like the commissioner wants because he’s coming to the rescue of this September’s non-races. Talk about another knee-jerk reaction! How long has the current format been in place? To my recollection, this is the only time in 17 years it may come down to the wire with no race. And may I point out that were it not for the wild card, there would be an exciting race in the AL East. And if the Braves were to close the gap on the Phillies, that would be another non-race race. Oh, but if the American league only had a second wild card, then we could throw the Texas – Anaheim race in the trash as well. They just don’t get it. The people who run this are so myopic. Mr. Selig wants 2 wild cards in each league having a play-in game. I can see this coming from 3000 miles down the road: the first wild card is the Yankees or Red Sox with the 2nd best record in the league. The second wild card is a so-so team—-we’ll call them the Seattle Mariners—-who happen to have a blue chip pitcher—–we’ll call him Felix Hernandez—-who throws a 2-hit shutout at the 2nd best team in the league, and on goes Seattle. Let the hand-wringing begin and sound the alarms. What a relief to have all the September 11th sensationalism behind us. I found the media’s coverage, be it sports, or “news” related, to be utterly repugnant. It was another excuse to show the burning buildings — a celebration of death. That old rallying cry, never forget, always sounded like a threat to me, but never so much as this past week. We may not be able to fund schools or health care, but thanks to the deeds of a few dirtbags with box cutters, we have an open-ended excuse to go to war. Our reaction to the attacks of September 11th incited a killing spree, the likes of which has not been seen since the invasion of Japan. Its result, besides the hundreds of thousands of murdered civilians, is that the U.S. is practically bankrupt and will soon be cutting medicare and social security. This reaction played into Al Qaeda’s hands. They knew they couldn’t win a war against the U.S. What they could do, however, was play havoc with our economy. The eroding of our constitutional rights was a bonus. It makes perfect sense that the sports worlds plays up the tragedy of September eleventh with endless tributes and military fly-overs. What better showcase for our militaristic policies than the black and white, statistics laden world of sports? The reaction to the attack was childlike, so perhaps it’s fitting that it should be featured in a kids game. I saw a little of the Mets/Cubs game at the bar I was working at last night. I don’t know who was announcing, (Buck?) but when he gave a “shoutout” to Homeland Security for keeping us safe I nearly threw up in my mouth. HOmeland Security has done a tremendous job keeping us in a constant state of anxiety. From the asinine color coded security threats, so expertly exploited by the Bush administration during election season, to the security theatre run by the TSA, they have succeeded in breaking our spirit while draining the federal budget. Who came up with the name Homeland Security? It sounds like the work of Cheney or Ashcroft. Am I the only one that thinks this name sounds fascist? Substitute “Fatherland” or “Rhineland” and you’d have a more apt title. I only hope now that we have passed the ten-year mark we can begin to put it behind us. It was a horrible, horrible day — the worst day ever in New York City. Even now it’s difficult to recall it without choking up. But if we’re never to forget, I believe we should look at the entire picture. Rather than play the victim, or the bully, we must look at our own house and see what can be done to improve it. I thought that Obama made a great speech last night. Then again, that’s what he does — he’s a great orator. We have yet to see him back up his rhetoric with bold ideas. I was glad that he called out the Republicans in Congress, when he made his gentle gibe about simple math. This isn’t political grandstanding. This isn’t class warfare. This is simple math. This is simple math. These are real choices. These are real choices that we’ve got to make. And I’m pretty sure I know what most Americans would choose. It’s not even close. It’s interesting to note that the bulk of the cost of Obama’s jobs program will be incurred in the form of tax breaks which will be given to companies as incentives for hiring. Even though Obama paid lip service to the idea that the rich should pay more taxes, (why should Warren Buffet pay less taxes than his secretary?) I will be surprised if such taxes are enacted. I cannot believe that the obscenely wealthy should be entitled to such an advantage when the economy is hanging by a thread. Then again, big money is a formidable force to be reckoned with. Certain issues in politics confound me, until I remember that there are forces unseen that are guiding the issues. Behind such forces is big money. Health care is something we can seemingly all agree on. Why shouldn’t there be a public option — polls show that the public favors it. Yet it was a nonstarter during the health care reform debate of 18 months ago. The answer is that the health insurance lobby is an exceptionally strong and wealthy force. They don’t want it, ergo we can’t have it. Gun control is another such issue. Who in the general populace is in favor of automatic weapons? I would guess the answer is well less than one percent. Yet efforts to try to ban such weapons are quixotic to the point that members of either party would be risking political suicide to even attempt reform. Again…follow the money. The same could be said of the Iraq war. It was obvious that the Bush and Blair administrations had no concrete evidence that Saddam had been harboring terrorists. Yet we went in. Why would we kill tens of thousands of innocent people, and spend trillions of dollars on an invasion that was, at best, a distraction from the ongoing war in Afghanistan? Of course it was about money. Either that, or stupidity. Take your pick. With four weeks to go in the 2011 baseball season we face a September devoid of pennant races. A coupe of weeks ago it was looking like I would be lucky enough to be residing in one of the few markets — San Francisco — involved in meaningful September baseball. How wrong I was. The end of August saw the Giants three games behind the plucky Diamondbacks. They were entering an easy part of the schedule, however which featured seven games against baseball’s worst team, the Houston Astros. The Giants, however, spit the bit, losing four of the seven, while the Dbacks overcame a mini losing streak to rattle off nine straight. The Giants could not overcome the myriad of injuries they have suffered all season long. Furthermore, the magic that journeymen players, Cody Ross, Aubrey Huff, and Pay Burrell delivered last year, did not carry over into the current season. Their pitching had been brilliant, but now is showing the wear and tear of the stress that comes with having no margin for error. Even their ace, Tim Lincecum, has looked mortal lately, blowing up during the last two games he has pitched. Currently the black and orange are riding a two game winning streak and are sitting six games out. It’s not hard to imagine them putting together a streak of wins –they will be remain in the west all month — but in order for them to catch up, the Diamondbacks would have to play .350 ball the rest of the year, which seems unlikely given the fact that they will be playing the same mediocre teams as the Giants. The NFL begins this week, and not a moment too soon. Let’s hear it for labor settlements! The trouble is, I’m stuck with the Raiders and 49ers, two teams that can ruin any given Sunday. This situation has, improbably, driven me to…college football. Oy! At least we have he 6th ranked Stanford Cardinals and their Heisman candidate, quarterback Andrew Luck. Stanford started off in true early season NCAA form — with a 54 point slaughter of patsy , San Jose St. This Saturday they will travel to Durham, North Carolina to play Duke, which should be a more competitive game — they’re only three touchdown favorites. But wait, there’s more. I live in a little town in the East Bay called Albany, which is just a few blocks north of Berkeley, and that, as you know, is the home of a certain Cal Bears. University of Berkeley, baby! And they’re 1-0, coming off an impressive, if not sloppy victory over Fresno State. Having lived in the east for so long, where college football was an afterthought, it feels odd to live just a couple of miles from a bigtime college school. I’m actually considering going to a game. Cal doesn’t do that well attendance-wise, so scoring a ticket shouldn’t be difficult. In the meantime, tomorrow is Wednesday and the A’s are home. This combination can only mean one thing: $2.00 ballgame! I am so there. A’s – Royals give it! The other night I was flipping through the channels when I happened across Clint Eastwood’s 1971 film, Play Misty For Me. I came in at the halfway point, but ended up watching the remaining half. I’d seen it several years ago, but I had forgotten much of it. Two things struck me about the film. One was how many similarities there are between Play Misty and For Me, and the 1987 thriller, Fatal Attraction. The most notable difference is that in Misty, Clint Eastwood’s character is a single man, whereas Fatal Attraction’s Michael Douglass is married. On the one hand you have this 70’s era cautionary tale about the pitfalls of being a promiscuous single man, and on the other you have an 80’s allegory on what can happen when a married man strays from the path of the straight and narrow. Even though both movies are titillating in their way, in the end they are proponents of celibacy, and in that way they are conservative. In both films a psychopathic woman attempts to commit suicide by slashing her wrist as a means of getting attention from her obsession. And both films feature a final confrontation between the lovers, culminating in the grizzly death of the woman. It’s interesting that both films paint the woman as an evil temptress — like the snake in the garden of Eden. The other striking facet of Misty is the music. Of course you are treated to a generous helping of Errol Garner’s Misty, but that’s not all. In the middle of the film there is a ten minute scene of uninterrupted music without dialogue. While Clint is falling in love with a new girlfriend, Roberta Flack is heard on the soundtrack singing The First Time Ever I Saw Your Face. The song eventually went on to become an enormous hit, due in no small part, I m sure, to this film. The very next scene shows Clint and his new girlfriend attending the Monterey Jazz festival. Again, there is no dialogue — the music takes center stage, both literally and figuratively. The scene begins with a burning trombone solo played by a man named Gene Conners, aka the Mighty Flea. The solo goes on for several choruses. Conners is playing in the Johnny Otis band. Otis was a rhythm and blues musician, as well as composer, and his heyday goes back to the ’40s. After the trombone solo the scene switches to none other than the Cannonball Adderley Quintet! They are playing a funky boogaloo and you can see his brother Nat on trumpet, as well as a young Joe Zawinul on piano. (he even had some hair then) You can hear the great drummer, Roy McCurdy on the track, but he is unseen in the film. When I was eight my Mom, Aunt, brother, and I drove from Los Angeles to Bakersfield to go to a cousin’s Bar Mitzvah. After the service there was a party at my cousin’s house. At some point I found myself alone in his room, and there I discovered his comic book collection. He had dozens, if not hundreds of magazines. I spent my remaining time at that house holed up in that room reading Superman, Batman, Flash, Green Lantern, and Hawkman comics. When we returned home I started asking my parents for spare change so I could buy my own comics. In the next two years I amassed a fairly respectable collection. 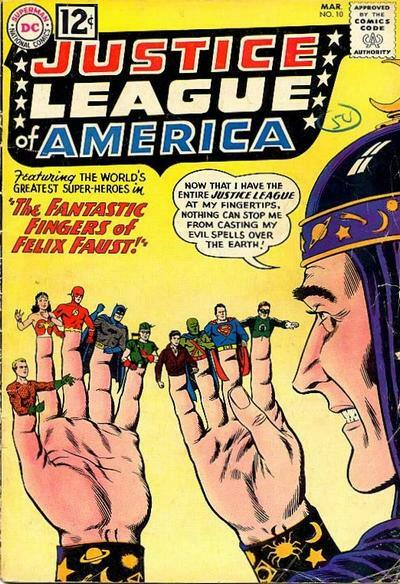 The Justice League of America, which consisted of most of the aforementioned heroes, was my favorite title , but I also liked the Legion of Super Heroes, as well as some of the Marvel books, such as Iron Man, Thor, Spiderman, and the Avengers. Comics cost 12 cents when I began collecting, and by the time I stopped they had gone up to a quarter. These days they’ll set you back between $2.50 and $3.00. One day, when I had reached the ripe old age of thirteen, I was walking down Hollywood Boulevard when I came across a collectible store, filled with old movie scripts, posters, and yes, comics. There I learned that you could make cold, hard cash by selling your comics to the store. It was that easy. So, like the idiot I was, (and would remain) I sold my entire collection. For $20.00. I was able to replenish most, if not all of my collection, and this time I was smart enough to hold onto them. They exist today 3,000 miles east of where I live in an upstairs garage in Shokan, New York. This is top of mind because of all things, DC comics is in the news. In the last week I have heard a segment on All Things Considered, as well as read an article in the Oakland Tribune, about DC comics. DC is the older of the two big comics companies — that’s where Superman, Batman, and Wonder Woman come from. Marvel has Spiderman, Hulk, and Captain America, among others. But I digress. This month DC is in the process of rebooting their entire catalogue of comics. Every book — I believe there are 52 of them — is starting over at #1, and the heroes are going to have different origins, and in some cases, different powers. In the case of Action Comics this is a shame. Superman originated in Action Comics way back in 1938, and the book has remained in existence all of these years, making it well into the 900s. How cool would it have been to have a chance to buy Action 1,000? A lot has said about the rebranding of these heroes, but I have read very little about what the differences are going to be — just that they want to make them more relevant to modern times. What does this mean? Are the heroes going to use smart phones and have tattoos? I hope this isn’t a lot of smoke and mirrors about change. (I’m looking at you, Obama!) If they’re going to the trouble of starting over, I want to see some real change. I’m actually considering checking out some of these books. I may even subscribe to the new Justice League. I hope they do a good job, but if they don’t, I hope they revert to Action Comics #945.